Think back to something that you learned that was really hard, harder than most things you were learning at the same time. Maybe it was a difficult mathematical or computer science concept. Maybe it was a complicated procedure for managing resources in a program. Maybe it was an intricate set of architectural principles for designing software. Is it still hard now, or is it easy? If the difficult concept is now something you use all the time, it's almost certainly much easier to understand than it used to be. You're familiar with how to use it and what to watch out for while using it. But even if you haven't used the concept since you learned it, it may now be much easier to pick up and use than you expect. I've had multiple experiences where I learned something difficult, especially in a college course, and then set it aside for a while before revisiting it because I needed it for some project. To my surprise, I found that I understood the concept much better than I thought I would, and I could use it effectively without days of study to relearn it. One case I remember in particular was the Digital Design Fundamentals course I took in college. I took it during my Freshman year, and I distinctly remember thinking during the course that I was not understanding the material as well as I should have. Everything was new to me—binary and hexadecimal number systems, Karnaugh maps (extremely useful for boolean logic, by the way), Moore and Mealy state machines, and combinational logic design—and it felt like it was going over my head. I got a decent grade, but I finished the course thinking that I might need to study this stuff a bit more before it truly sunk in. A couple years later I picked up the textbook again to brush up on my digital fundamentals for a more advanced course, and lo and behold, I found the entire book to be super easy. I had been using most of the concepts all along in other courses without knowing it because they were, well, fundamental, so I already had a solid working knowledge of them with no need to revisit the textbook. Other things that stick out as being really difficult when I first learned them but much easier now are pointers, recursion, and interrupts. (There are also things that will always be hard, especially the big two: naming, caching, and off-by-one errors.) Pointers and recursion are fundamental concepts that, once you understand them, will make you a much better programmer than you were before. You won't just be better; you'll be a different kind of programmer altogether, able to solve whole classes of problems much more easily and elegantly than you could before. Interrupts are also a fundamental concept, although not as useful for all types of programming. They are most applicable to embedded and system programming. At first glance, pointers don't seem that complicated—a pointer is simply a variable that contains a memory address that refers to another variable—but to someone who has never seen or used them before, they can be mind-bending. For some reason adding a level of indirection to a variable confuses everything. Things get even more confusing when passing pointers as arguments to functions, using function pointers, and figuring out pointers to pointers. At some point, everything clicks, and you go from completely not understanding pointers to wondering why you thought they were so hard. They suddenly start to make perfect sense, and you never look back. Of course, pointers may still trip you up from time to time, but not because you don't understand them. Solve a trivially easy base case of the problem. Solve the current case of the problem by splitting it into a trivially easy part and a smaller version of the current case. Make sure that the smaller version of the current case will always reduce to the base case. It sounds simple—and once you get it, it is—but for programmers new to recursion, it is incredibly easy to get lost in the details. Recursive problems are really hard to think about if you try to think them through in the iterative manner that most people are used to. You have to let that way of thinking go and trust that the combination of solving the base case and continually reducing the problem to the base case is actually going to work. It's not a normal way of thinking, but it is extremely powerful for certain classes of programming problems. Once you understand recursion, those problems become much easier to think about. Interrupts add their own complexities to programming, and learning how to deal with those complexities can be a real struggle. A program with interrupts is actually a form of a multi-threaded program with all of the same issues that any multi-threaded program has, including deadlocks, synchronization, and memory consistency. Not that these threading issues are easy once you have experience with them, but even understanding the basics of interrupts is challenging at first. Interrupts can happen between any pair of instructions in your program, and that doesn't mean only the instructions you're using in your higher level language. An interrupt can happen between assembly instructions that make up one higher level operation, so an interrupt could happen right in the middle of your count++ increment. Because of this behavior, you have to be much more careful about how you use variables that are shared between the interrupt service routine and the main program. Having a good understanding of how interrupts work is vital to embedded and systems programming, and it takes time to master. I remember how hard it was to understand each of these concepts. I struggled with pointers. I wrestled with recursion. I wrangled with interrupts. None of them were easy at first, but now I use them often without breaking a sweat. I can think of plenty of other examples of difficult concepts, some I use regularly and others not so much. Because I've had good experiences with some hard things getting easier with time, I'm not afraid to pull out a concept that I haven't used in a long time to solve a gnarly problem. Even if it was a hard concept to learn, it's probably easy now. This idea—what once was hard is now easy—has two major implications. First, when you are exposed to something new, it can feel overwhelming, and especially if you are trying to learn it purely by reading, it can feel impossible to fully understand and remember it. After using that concept to build something real, and struggling through all of the implementation details and reasons for doing things a certain way, you can come back to the original concept and find that it now seems trivially easy. Don't get discouraged when learning and things don't make sense right away. Sometimes all you need is more exposure and practice before everything starts falling into place. Second, it is easy to forget that some concepts are difficult to learn and that you need to give yourself time. As you learn more things, more things are easy for you. You remember all of the things you can do that are easy, and you start to think that it's better to fall back on the skills you've already mastered than to learn a new, difficult concept. If you remember that the stuff you already know was once a real struggle to learn, then you may be more willing to struggle through another new concept, confident in the knowledge that this, too, will become easier with time. And don't think that this idea is limited to programming. It's true of everything in life that starts out hard. Once you know it, it's easy. Performance optimization can be great fun. Finding new ways to make a code base run faster, have more throughput, or support more users is immensely satisfying. Pursuing optimizations can also lead you down plenty of dark alleys with disappointing dead ends. Figuring out which optimizations to pursue and avoiding the ones that end up making performance worse requires decent knowledge of the technology stack that you're using and an open mind to explore the code to find where it most needs to be sped up. Our intuition can easily lead us astray when trying to reason about what parts of a program are slow and should be the target of optimization. One reason that this is such a common problem is that the human brain processes things differently than a computer. While the brain is a massively parallel processing structure, the microprocessor is essentially a sequential processing machine. Sure, it does do some parallelization, but not nearly on the level of the brain, so the types of computation that are easy in each system are vastly different. These large differences in computational models between the brain and the microprocessor lead to misconceptions in what we think would be the optimal algorithm for any given problem. To make up a simple example, consider what you would do if given a huge matrix of numbers and asked to manually change them all to zero to reset the matrix. Assume that it is a sparse matrix, so most of the numbers are already zero. Why would you do this manually? I don't know. It's a contrived example, so humor me. Since it is a sparse matrix, the fastest way to clear the matrix is probably to find the non-zero values and change them to zero. The reason this algorithm can be stated so simply is because the "find non-zero values" operation is almost instantaneous for us. Our visual system is excellent at pattern matching, and we can easily pick out the non-zero values in a field of zeros. The same is not true of a computer program. The same algorithm translated to a program would have to scan through every element of the array, check if it's zero already, and change it to zero if it's not. Checking if every element is zero is a waste of time for the computer since it has to touch every element anyway. It might as well simply write a zero to every memory location, and since the matrix is probably contiguous in memory, it could do this operation even faster by writing larger blocks of zeros at once. It's the same task, but the brain and the microprocessor each lend themselves to different optimal solutions. These differences come up all the time in programming. It's common when processing a lot of values in a loop to only do a certain calculation on some of the values. If the combination of the filtering of values and the calculation on the values that pass the filter can be converted into one calculation on all of the values, the latter option is often faster than the former operation. Not only does it optimize for the type of calculations that are most efficient for a microprocessor, but it also removes a code branch inside of a loop. The resulting loop makes more efficient use of the hardware because more instructions can be in flight in the processor pipeline at once and there will be less data-dependent branch mis-predictions. All this talk about processor pipelines and branch prediction leads into another point. Getting good at recognizing where code performance can be improved is a skill that requires a good mental model of how computation is done at multiple levels of your technology stack. If you're programming in a web framework like Ruby on Rails on Django, you'll have a better idea of how to optimize your code if you know the underlying programming language better. Going further, knowing more about how compilers and interpreters work will enable you to see more optimizations. You can keep drilling down to gain an even better understanding of how computation works in a computer. Assembly languages have quite different ways of doing computation than high-level languages, with multitudes of addressing modes and special instructions for controlling program flow and transforming data in interesting ways. Microprocessor architecture has all sorts of ways to speed up code as well, with deep pipelines, multiple FPUs (Floating Point Units) and ALUs (Arithmetic Logic Units), branch prediction, instruction trace caches, and cache-memory hierarchies. Computer Organization and Design, and Computer Architecture: A Quantitative Approach are good books to start exploring microprocessor architecture. Although knowledge is power, knowledge can also be dangerous, so knowledge of the tech stack should be used wisely. Once you have a better idea of how computer computation works, it's easy to fall into the trap of trying to micro-optimize every line of code. I'm not sure why that's the case. Maybe after learning about all of those cool optimizations it's hard to resist attempting to do them by hand, but if learning about compilers and hardware architectures teaches you anything, it should teach you that tons of optimizations are being done to your code automatically. Instead of spending your time trying to micro-optimize stuff that the compiler and hardware can do better, you should be focusing on algorithm complexity and domain knowledge, areas where those lower-level tools can't possibly help you. Knowing about the lower levels of abstraction can help you make better higher-level decisions, but you shouldn't use that knowledge as an excuse to attempt to duplicate what your tools are already doing for you. I've inherited code bases from other embedded software engineers who did not trust GCC to compile their code correctly with optimizations turned on. My impression is that it is a common belief in the embedded software world that the only safe way to compile C or C++ code is to do it with optimizations turned all the way off. While it may be true that a particular code base works with optimizations turned off, and it crashes with optimizations turned on, that doesn't mean GCC optimizations aren't safe. GCC is a pretty well-proven tool, and if I had to put money on it, I would bet that GCC is correct and there's a runtime problem in the code rather than the other way around. If code doesn't work or it's unstable with optimizations turned on, it's most likely because of a race condition or memory leak in the code, and compiling without optimizations is hiding the problem. Trust me, you don't want to run production code with optimizations turned off. It's like buying a Ferrari and never driving it over 20mph. You are sacrificing a tremendous amount of performance for the illusion of safety. Consider a few of the things that the first level of GCC optimizations gives you: faster subroutine calls, branch prediction from probabilities, and register allocation. Register allocation alone is huge. Without it, the assembly code that's generated will read every variable in your code from memory, perform the operation in the expression being evaluated, and store the result back to memory in the variable specified on the left-hand side of the expression. Even temporary variables that are only used once to calculate intermediate results are assigned a memory location and values are loaded and stored to those locations. Register allocation uses the processor's fastest memory to store intermediate values, and operations can be chained together using these registers as operands. Register allocation also enables the processor to do register renaming and use a much larger internal set of registers not available to the assembly language. Without register allocation, not enough registers get used to take advantage of register renaming, and the processor pipeline utilization is so restricted that not many instructions can be scheduled to execute at once. Why waste all of that power by turning off optimizations? Other optimization levels add even more performance gains by doing a deeper analysis of the code to do things like reorder instructions, unroll loops, and inline functions. These are riskier optimizations for code that's not robust against race conditions, but the real problem that should be fixed in this case is the code. Higher optimization levels also are more likely to increase code size. The first level will almost certainly reduce code size as well as increase performance because it's primarily removing instructions and condensing code to make it faster. The higher levels start doing things that increase code size, and code size may be a real issue in some applications. In any case, if you're optimizing performance, you should definitely turn compiler optimizations on to some appropriate level. Otherwise, you're ignoring a huge performance gain for no good reason. What about doing some of these optimizations by hand where they're needed most? Well, compilers and VMs (virtual machines used for interpreted languages and newer compiled languages like Java and C#) can do all kinds of intricate optimizations that would take us humans way too long to do in every place that they would help, and get it right every time. The compiler or VM writer has to get it right once—granted, for the more complex general case—and then the compiler or VM can use that optimization every place that it detects it to be applicable. For example, Steve Yegge describes a great optimization that was figured out way back in 1994 in his Dynamic Optimizations Strike Back post. It's called type-feedback optimization, and what it does is during run-time the VM watches the type of the dynamic method calls. When a certain type is used in a method call in a loop, the VM assumes that type will be used the next time through the loop and inlines the method. If it was wrong, a guard instruction will catch the misprediction and recover, but if it was right, the program gets a nice speed-up. That type-feedback optimization is one example. Compilers and VMs implement hundreds, if not thousands of optimizations, and they keep getting better and better all the time. Even if we could do these optimizations slightly better by hand, why would we try? The compiler can do so many more optimizations than we could even remember and do them on much larger code bases because it's automated. Trying to compete with that kind of scale is rather silly. We should be looking for higher-level optimizations that organize the overall structure of the code, and use the best algorithm for the task that we're trying to accomplish in the code. Then we're working with the compiler, leveraging the strengths of both us as programmers and the compiler as an automated optimization system, instead of trying to compete on a level that ends up being a waste of time. I've come this far without even mentioning that you should profile your code before optimizing. Profiling is hugely important because if you don't measure where your code is wasting time, you're much more likely to make the wrong optimizations based solely on intuition. The places where a program is slow can catch you by surprise, and the optimizations that fix it can be equally surprising (sometimes surprisingly easy). At this point it's pretty much common knowledge that you have to measure before you optimize, but you still need to be careful in how you measure. Using microbenchmarks to measure the performance of small snippets of code before and after optimizations can be incredibly misleading. It's much better to measure the performance of code in a real application with a real environment and a real workload. Reality can be drastically different than microbenchmarks, and things like disk and network accesses, process interactions, and realistic data sets can have a huge impact on a real program while a microbenchmark may not even run into those issues. Caching can also have profound effects on the run-time performance of code, and microbenchmarks may hide the fact that certain optimizations perform well in isolation but trash the cache for the rest of a larger program. Organizing data structures to take advantage of caching can drastically speed up a program, but be careful because different processors have different cache characteristics. You could be optimizing for a particular, narrow cache architecture. If a program will run on different cache architectures, profiling should be done on as many of those architectures as possible to make sure the code isn't being optimized into a corner. Optimizations can make code brittle. Heavily optimized code becomes completely dependent on the context under which it was optimized, and if that context changes—because the processor or the compiler or the operating system changed—the optimizations can actually make code slower than if the optimizations weren't done at all. It's best to first make code clear, clean, and readable. Most of the time if the code is well-designed, it doesn't need to be optimized further. Making it clean is good enough. Most poorly performing code I've come across is also messy, verbose, ugly code. Cleaning it up has the dual benefits of making it easier to understand and improving its performance. Only optimize when performance becomes a problem, measure where it's a problem, and focus on improving the code that is actually a problem. When you do optimize code, remember that your brain does computation much differently than a computer does so your intuition is probably wrong, your knowledge and understanding of the technology stack can greatly help you find optimizations, your compiler is your friend so you should work with it, and your profiler will give you the best answers if you measure reality. The best optimizations may not be obvious, but with an open mind, you can find them. 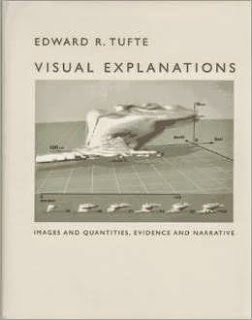 I came across glowing recommendations for Edward Tufte's books on a number of blogs, and I finally got around to reading them. They're all fairly short books, filled with charts and graphics, so they didn't take long to get through. I'll say right up front that I have mixed feelings about them. The overarching theme of all three books is apparent from their titles. The goal is to describe to the reader the best way to present information in charts and graphics so that the data can be clearly analyzed without distortion or confusion. Tufte obviously cares deeply about the accurate, unencumbered display of information, and parts of each of these books are excellent. But other parts were frustratingly repetitive or overly simplistic. Let's take a deeper look at the merits of each of these visual manuals for the chart designer. Tufte warned the reader in the introduction of this book that the prose would be terse, and he wasn't kidding. Don't expect to read a detailed exposition on the design of charts here. The writing is minimalist, bordering on unbearable, but I guess that's the point. The graphics should speak for themselves, and for the most part, they do, although some of them were too small to read easily. I still felt the writing did the book a disservice because the stilted prose made it much less engaging than it could have been. It's likely that I read this book out of order. I read it first, going by it's publication date, but I think it was actually written after Visual Explanations and possibly also The Visual Display of Quantitative Information (now on its second edition). I think it would have been better to read Envisioning Information after either of the other two books, or even not at all, because it's basically a quick summary of the principles of good chart design with a large number of examples. It's only 100 pages and took a couple hours to read through while examining the charts, and it felt like a series of review exercises for someone who had already been exposed to the material. The book is split up into six concise chapters: Escaping Flatland, Micro/Macro Readings, Layering and Separation, Small Multiples, Color and Information, and Narratives of Space and Time. Each chapter contains an explanation of the idea and a number of charts and graphics that either exemplify the idea or show how its misuse can corrupt the presentation of data. Each chapter covers important concepts to think about when designing charts, and in the first chapter, Tufte addresses the restrictions of the 2-dimentional page representing the 3-dimentional world with an analogy to writing. I definitely agree on the restrictiveness of text. Putting certain thoughts or descriptions into a linear sequence, and doing it well, takes a lot of focused effort. Reading explanations and gaining understanding from text is also difficult. Often you need to know many different things at once before you can truly understand a concept, but you can only read one sentence at a time. It takes an accumulation of knowledge before all of the concepts settle out and start to make sense. Designing charts is similarly difficult because charts are flat, but the world is not. Most of the time a chart is trying to distill a large multivariate system into a 2-dimentional representation that can't possibly show everything. The condensation of relevant details and the elimination of superfluous ones is part of what makes a good chart design effective. A major theme of good chart design is the identification and removal of chartjunk—meaningless graphics and decorations that do not add in the least to the understanding of the data represented. Tufte maintains that charts should be data-rich and data-dense. Chartjunk takes up space that could be used for data at best, and it adds to confusion and distraction at worst. While carrying the theme of reducing chartjunk through the rest of the book, Tufte covers how data can be layered to reveal new insights at multiple levels of detail, how repeated small charts with variations can bring out patterns through comparison, and how the judicious use of color, lines, and borders can greatly assist in understanding data. Descartes did the same thing in his Principia, repeating one particular diagram 11 times. Such a layout makes it unnecessary to flip from page to page in order to coordinate text with graphic. It's a very nice change from most other books I've read with graphics of any kind—programming and text books included—where graphics could be multiple pages removed from their descriptions. 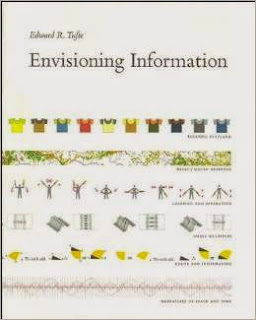 While Envisioning Information was a set of examples presented in quick succession with little discussion, Visual Explanations was a much more engaging read with a smaller set of more focused examples and deeper analysis. All of the same concepts were covered and then some, and the format was much better. In the first chapter, Images and Quantities, Tufte discussed the importance of correct scaling and appropriate labels to give perspective on charts and graphics. He cautioned that scale can be used to both illuminate and deceive, so you need to be careful how you use it. It's a fundamental concept that you see misused all the time. ... the credibility of a report is enhanced by a careful assessment of all relevant evidence, not just the evidence overtly consistent with explanations advanced by the report. The point is to get it right, not to win the case, not to sweep under the rug all the assorted puzzles and inconsistencies that frequently occur in collections of data. He warns about the perils of data mining—searching for the best representation of the data to prove the desired outcome—and only presenting positive results. In contrast, the poor presentation of O-ring data prior to the Challenger launch on that cold, fateful January day in 1986 resulted in a disastrous shuttle explosion. The discussion and analysis of both events was excellent, and the book is worth a read for this chapter alone. Tufte did go a bit far in his criticisms of Richard Feynman and his makeshift experiment to demonstrate how the O-ring material behaves at cold temperatures by submerging it in a cup of ice water at a congressional hearing. Feynman obviously knows the difference between a careful scientific experiment and a theatrical demonstration, and I would give him credit for the effective use of the limited resources available to him to prove a crucial point. I'm sure he was well aware that he was in some part playing political theatre. The next chapter used the field of magic to show how multiple layers of information can be represented with shading and outlines of objects behind other objects. Magic involves showing one thing to the audience while doing something different in the background. Teaching someone to do magic through pictures involves showing both of these perspectives at once, a valuable skill for representing multiple layers of data in a single graphic. The rest of the book covered a number of other chart design principles, wrapping up with a chapter on many examples of graphics throughout history—some good, some horrible. This chapter went a bit long, and was not as clear and engaging as the rest. Still, it contained some useful advice on how to represent information in the form of pictures while telling a story in much less space than could be done with words. This book was my favorite of the three. It largely covered the same chart design principles as the other two books, but it went into more depth and the discussion was more organized. In this book Tufte methodically lays out what makes a good chart design and what will ruin otherwise good data. Graphical excellence is the well-designed presentation of interesting data—a matter of substance, of statistics, and of design. Graphical excellence consists of complex ideas communicated with clarity, precision, and efficiency. And graphical excellence requires telling the truth about the data. In time-series displays of money, deflated and standardized units of monetary measurement are nearly always better than nominal units. The number of information-carrying (variable) dimensions depicted should not exceed then number of dimensions in the data. 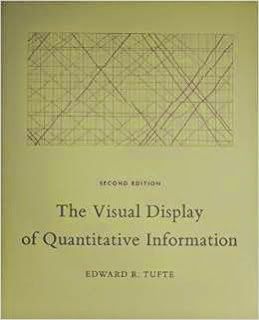 After laying the foundation of graphical excellence and integrity, Tufte uses the rest of the book to show how to achieve these ends. I especially enjoyed the chapter Data-Ink Maximization and Graphical Design, where Tufte redesigns a number of different types of plots. Some redesigns I liked, some I didn't, but all of them made me think about why I preferred certain designs. His redesign of the histogram was pretty slick. He removed the chart border and tick marks, instead putting white lines through the bars themselves to mark grid values. It had a very clean look. On the other hand, I thought his redesign of the box plot with a new plot called a quartile plot—with its middle line offset from the line showing the extents of the data—was less clear than the original. I prefer a box plot with dots showing the max and min of the data set, a line going from the second to the third quartile, and a short cross bar at the mean. It's still minimalist while being much easier to discern the important qualities of the plot. Most of his redesigns don't seem to have caught on since this is the first I've seen of them in many years of looking at innumerable charts and graphs. Throughout the book, Tufte seems to focus too much on increasing the density of information in charts. He advocates shrinking charts down to increase their resolution, and it gives the impression that higher density of information is always better. If a chart doesn't display more than a couple dozen values, he thinks that the data is better shown in a table than a chart. I somewhat disagree with this sentiment. While well-designed, high-density charts can be great for seeing patterns in complex data, simple charts can also be quite illuminating, and not everyone cares to squint to see them. A clean, organized chart of a dozen—or even a half dozen—values can make a point immediately obvious. A table of that same data would take more time and effort to discern the same pattern. Human beings are much better at pattern recognition of visual displays than of rows of numerical values, and the enabling of that recognition should also be a primary concern when displaying data. Tufte wraps up the book with a summary chapter that brings the over-arching concepts of good design together with a few interesting final thoughts. He advocates a better integration of text and graphics so that they flow together seamlessly, with neither able to stand alone. Instead of referencing graphics in the text with "(See Figure 5)" and attempting to fully describe the graphics in the prose, we should use the text to tell the reader how to interpret the graphics and annotate the graphics directly with concise labels of important features. That's quite a diversion from how we learned to combine graphics and text in school, but it makes some sense. The goal is clarity and understanding, and a well-designed text and graphic combination will have those features without the constant referencing of the graphic in the text, often on a separate page. The information is most easily absorbed when important points are as close to the source as they can get. Overall, I thought this book was quite good. Tufte covers the principles of chart chart design well, and he shows rather than tells the reader what he means with plenty of thoughtful examples. I would definitely recommend it to anyone who designs visual displays of data or wants to understand what makes a chart clear and effective. Despite the fact that these are all short books, with less than 500 pages between them and half of that being graphics, I wouldn't recommend reading all of them. They all cover the same topics, more or less, and reading them all gets fairly repetitive. The Visual Display of Quantitative Information is the most complete of the three books, and I would say the most engaging read. Even though I didn't agree with everything, it never failed to help me clarify my own thoughts, and if anything, that is the mark of a good book. If you really enjoy that book and want more, then go for Visual Explanations next. It covers most of the same material in a different way, and the in-depth examples of the Cholera Epidemic and the Challenger Explosion are a great read. Envisioning Information can safely be skipped since it doesn't cover anything new, and the material it does have is more superficial than the other two books. In this case less is more, and The Visual Display of Quantitative Information is enough. Steve Yegge has a way with words. I like Stevey's Drunken Blog Rants (and plain Blog Rants) because he says things that need to be said in an engaging and entertaining way, and he takes the proper amount of time to say things without being too terse or dragging things out. Some people think his posts are too long, but I disagree. He goes into more depth and explores his ideas much more thoroughly than he could in a shorter format. I enjoy spending time on these topics, time that a short blog post wouldn't give me. In fact, I would welcome a book because the longer format would do thoughtful topics like Steve's even more justice. Reading all of Steve's posts would be much like reading a book, although a somewhat disjointed one. Some posts wouldn't fit in at all. To get some feel for what a Steve Yegge book would be like, I've put together 15 of what I think are Steve's best rants. It wouldn't be a long book, taking only a night or two to read through, but the topics are good and it sticks to his more timeless writings. I reread them all for this post, doing one per day and really enjoying it. Each one of these posts is here because it's either an entertaining read or great food for thought, or both. Metrics systems, much like documentation systems, have a fundamental tradeoff: you can have a complex system with lots of features, or you can have a simple system with few features. But not both. The solution he ended up with was to create custom systems from simple components to address the specific problem at hand. Wherein Steve ponders whether or not you should intimately understand the abstractions you use. It is a really hard problem. How much time do you spend understanding how your tools are built and how they work? There are arguments for both sides. Plenty of programmers are effective only knowing high-level languages and even higher-level frameworks while chalking all of the underlying technology up to magic. Other programmers make awesome stuff hacking away on low-level things, probably making the high-level languages and frameworks that everyone else uses. Knowing where and how your abstractions leak can save you when they break down and you have to work around the mess. Plus, I find learning and understanding how your tools work to be fascinating and well worth the effort for personal development. Steve tackles the issue of programmers judging how good they are and how they can get better. One flawed way is for companies to create metrics for programmers that the programmers then proceed to dissect and game for all they're worth. Another one is the stack-rank method of rating programmers, and it over-simplifies a programmers worth by projecting all of a programmer's qualities onto a single 'goodness' axis. Turning to how a programmer should get better, he looks at how almost every other profession has methods of competition to incentivise people to practice and get better, while very few programmers practice. Programmers that don't practice or try to learn things they don't already know tend to think they know enough to do their job and there's no reason to learn more. If they need something new to do their job, they can learn it in real time. It's a case of not knowing what you don't know that could make you a much better programmer all the time, not just for some particular task. To overcome that attitude, you need to be cognizant of holes in your knowledge that could be potentially useful to know, and make an effort to learn those things. Then the hard part of actually learning and improving begins. Programming styles can be classified in the normal way as imperative, functional, or declarative, but they can also be classified as six different memory allocation styles. Steve's made-up allocation styles are allocation-free programming, buffer-oriented programming, collection-oriented programming, list-oriented programming, query-oriented programming, and pattern-match programming. He explains each style in detail, the trade-offs involved in each one, what problems are easy or hard when using each style, and which programming languages make the most use of each style. He hits on a lot of important points about problem analysis, optimization, and code organization. He also starts what becomes a long-running theme of Java-bashing. Generally speaking, strong static typing has gotten in our way, time and again, and weak typing has never resulted in more "horribly bad" things happening than the equivalent strong-typing approaches. Horribly bad stuff just happens sometimes, no matter what approach you use. Besides, the real reason big systems are only written in strongly typed languages may be because using strongly typed languages results in big systems. The same system written in a weakly typed language could be orders of magnitude smaller. Another rant from Steve in his attempt to restart his blogging about the things he really wants to talk about, this post starts off with what I find is a very accurate assessment of Ruby. It's hard to talk about Ruby because it's so good that it just steps out of the way, and all you're left with is the problem at hand. He then rants about some of the Java framework libraries before getting to the real meat of his post—literals in Java. Java essentially doesn't have literals, except for a few basic types, and that creates some serious problems. The discussion is one of the best I've seen on why good literal syntax is important, and it brought up issues that I never thought about but run into all the time. I don't program in Java, but I do program in C and C++. They have similar issues with literals, although not quite as bad as Java. He also takes some good shots at OOP, showing that it's not the answer to everything. I think he was right, and more and more programmers are coming around to the realization that other paradigms, like functional programming, can also be very useful for classes of problems that OOP can't deal with. This is the post where Steve tries to convince you of the merits of learning how a compiler works, and he does a pretty good job of it. I'm not only convinced of the merits, but every time I read it, I end up wanting to write one myself. I did write one in college for a toy language that looked vaguely like Java without 90% of Java's features, and it was written in Java. Now I feel like that didn't really count, especially because like Steve, I wasn't fully paying attention in that class. Now that I know more about how important compilers are, I want to explore them more thoroughly. If only I had the time. Anyway, the post goes through why compilers are important, what you can do with compilers (hint: it's not all machine code generation), and a bit about how compilers work. They generally have three phases: parsing, type checking, and optimization. Each phase is a world of its own, and the way Steve presents it makes for an interesting read. If you're at all interested in compilers before reading it, you'll be wanting to write your own compiler by the end. I warned you. This is a very long post (and probably my favorite of all of his posts) about how programmers develop from beginners to experts and how they can handle looking at a higher density of code over time. The first half of the post focuses on how new programmers will over-comment their code while experienced programmers strip away most of the meta data (in the form of comments) and compress their code down so they can see more of it at once. When programmers from different ends of the spectrum end up on the same team, conflict ensues because of how differently they look at code and how different their needs are. I tried writing a similar post with many of the same points, but Steve presents the topic in a much more entertaining way, I think. Then he does some literary judo in the middle and ends up transforming the discussion about meta data into a critique on static typing. Inexperienced programmers will overuse comments and static typing in the same way, while experienced programmers don't need those things and end up getting much more real work done. I can definitely see my own perspectives on programming evolving along similar lines as I gain experience and learn more languages and language features, and the whole post really resonated with me. This summary in no way does the post justice. There is way too much good stuff in it. You have to read it yourself to get the full effect. In this post Steve takes on Joel Spolsky's well known post and the book that resulted from it, Smart and Gets Things Done. He brings up a lot of good points about how it's extremely difficult to reliably find people that are smart and get things done, that there are actually a fair number of such people, and for a startup company, that is not actually what you want. You want people that are so good, they are actually Done and Gets Things Smart. Done in the sense that they get things done so fast that it only ever seems like they're finishing things and moving on to the next big task to knock down. Gets Things Smart in the sense that everything they touch gets much better in ways that you would never have even thought of. It's an interesting way to think about the truly exceptional programmers, and the big issue is how do you really find these programmers? You wouldn't ever know who they are unless you worked with them and experienced their incredible productivity and abilities for yourself. The challenge of recognizing, acknowledging, and hiring someone who is much smarter and better than you is not something most people are ready or able to do. It is a humbling and thought-provoking post. Steve covered a lot of ground not only in these 15 posts, but in all of his blogging. I thoroughly enjoy reading and re-reading his stuff because he has such an entertaining writing style and I learn new things every time I come back to it. He has a couple overarching themes to his posts that resonate quite strongly with me. First, he is passionate about learning to make yourself a better programmer through thorough research and study, especially by reading good books. I completely agree, and I appreciate how that sentiment comes through in his writing. Second, he believes strongly in good tooling for programming and in constantly striving to improve those tools and languages that we use every day. We're never going to have the one programming language to rule them all, but we can keep making them better and better. Every time I read his posts, I get a renewed interest in learning new languages. Now if you'll excuse me, I have a book I should be reading.